sunshine and whimsy. 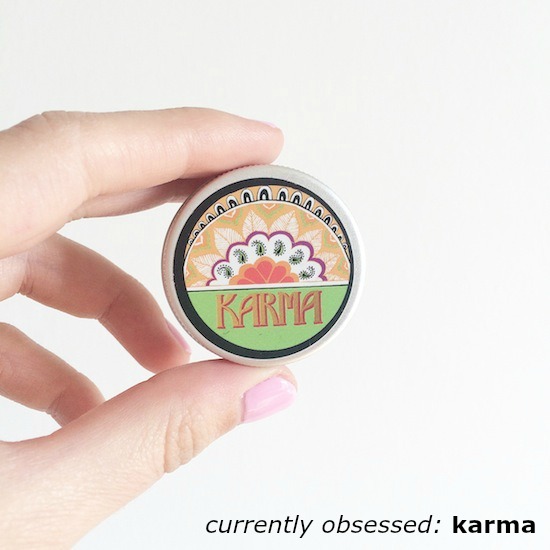 : currently obsessed: karma. My obsession with Lush's Karma scent began with the bubble bar. I loved it. I love their bubble bars in general—so many bubbles and leaves my skin soft!—but the Karma scent, love. Luckily, the Karma scent lasted longer than the Sun did. I liked the solid perfume so much, I decided to try the spray version. I bought the small bottle first, and then ended up ordering the bigger bottle. I still find that I sometimes need to reapply it halfway through the day, though. I apply the spray in the morning and maybe use the solid in the afternoon (I keep it in my desk at work). Since I began wearing it, I've received a lot of compliments! Two more things: 1) While "regular" perfumes give me a headache, Lush perfumes don't bother me! 2) I wouldn't consider myself a patchouli fan, but still love this scent! In fact, I like the scent so much, I've also been using the Karma Kream body lotion and even ordered the solid shampoo bar. Yup, it's safe to say I'm obsessed.